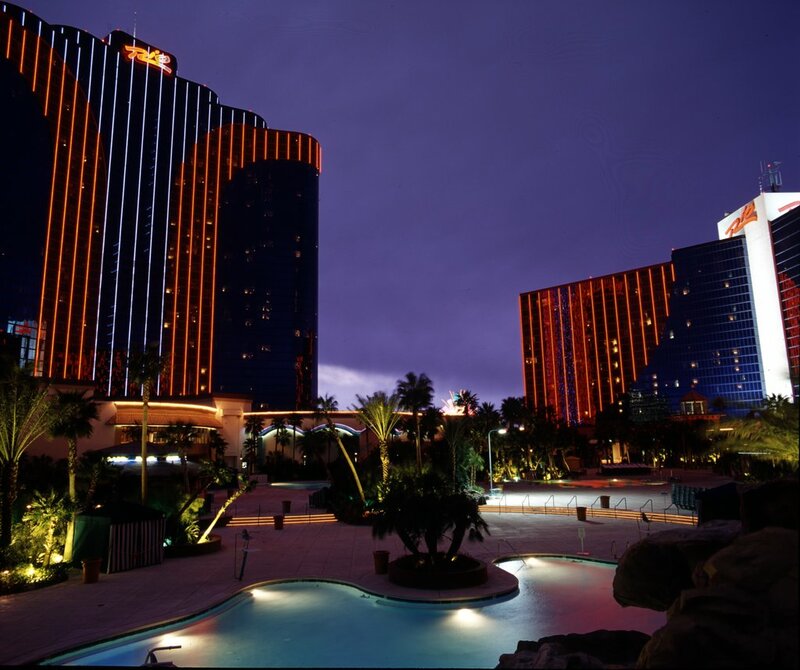 In addition to its 120,000-square-foot casino, the Rio All-Suite Hotel offers several nightclubs and live performances from Chippendales dancers, Penn & Teller, and Carnaval dancers suspended in floats traveling above the casino floor. Dining options include a seafood buffet, a Japanese restaurant,a sushi bar, an American grill, a wine cellar and tasting room, New England style seafood restauraunt, an Irish Pub, a South American cafe', an Indian restaurant, and 24-hour room service. The seasonal outdoor pool complex has four pools (including one for children), a sandy beach, five spa tubs, two pool bars, and rental cabanas. The health spa (surcharge) offers treatment rooms, saunas, steam rooms, spa tubs, and a pool-view fitness center. Designed to resemble a Rio de Janeiro neighborhood, the 60,000-square-foot Masquerage Village Shops feature such items as artwork, flowers, jewelry, sports memorabilia, resort wear, children's clothing and toys, and souvenirs. A business center provides cell phone and laptop rentals, high-speed internet access, printing, faxing, copying, and other services (surcharges). Wireless Internet access (surcharge) is available in the hotel's 163,000 square feet of meeting and event space. Valet and self parking are complimentary. Scheduled shuttle service to the Strip is provided from midmorning until late night.